PH is a measure of the acidity, or alkalinity of water. The pH scale ranges from 0-14, with 7 being neutral. Below 7 is considered acidic, and above 7 is considered alkaline. Rainwater is naturally a 5.5 pH. Most water in Maine is below 7 on the pH scale. Water that is strongly acidic or alkaline is corrosive and can dissolve toxic minerals from plumbing systems (such as copper piping or lead soldering on piping) that can cause health concerns. Additionally, the corrosive nature can lead to costly repair and/or replacement of your plumbing system. Acidic water dissolves copper leaving a tell-tale blue or green staining on fixtures. Also, acidic and alkaline water may interfere with the effectiveness of other water treatment systems. You will get the most accurate pH test result by testing onsite because the longer the wait before testing a water sample, the higher the pH will be when tested. If you have a low pH, also known as acidic water, an Acid Neutralizer should be installed. An onsite evaluation is highly recommended before installing an Acid Neutralizer because if you have hard water or other impurities, this may need to be addressed, also. The system consists of a mineral tank with media inside (often referred to as a bed) and a control head. In order to raise the pH, the Acid Neutralizer’s media is self-sacrificing and eventually more media will need to be added. We recommend making an appointment to have the level checked once per year. An Acid Neutralizer has some physical filtering capabilities, also. Impurities, such as iron, will collect in the filter bed before getting to your plumbing. The control head timer will be set to automatically backwash every few days to clean out the media inside the tank. 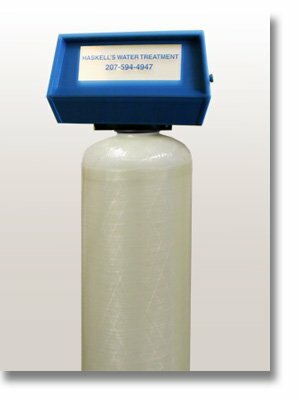 Call Haskell’s Water Treatment Inc. today at (207) 594-4947 or 1 (800) 244-4947 for more information about acid water.